How to Reset iPhone – Learn How to Reset any Model of Apple iPhone. Soft Reset / Hard Reset / Factory Reset. iPhone 6, iPhone 5, iPhone 4S, iPhone 4, 3G and all other models. Many a Times you may need to reset your iPhone for several reasons like to fix minor or major problems and bugs, to erase data before selling, problems with touchscreen, buttons or switches. The first thing to learn here is that there are 2 (TWO) different types of RESET Options in an iPhone or any other Brand of Smartphone – Soft Reset and Hard Reset. The reset process mentioned below are applicable to all models / generations of iPhone including – Original iPhone, iPhone 5S, iPhone 5C, iPhone 5, iPhone 4S, iPhone 4, iPhone 3GS, iPhone 3G. Soft Reset – This option is suitable if the iPhone starts giving minor problems. Soft reset clears the memory of the iPhone thus fixing most minor problems. The reason for these minor problems could be buggy apps or bad apps that keep crashing. Soft reset of the iPhone will clear the memory and fix the problems. 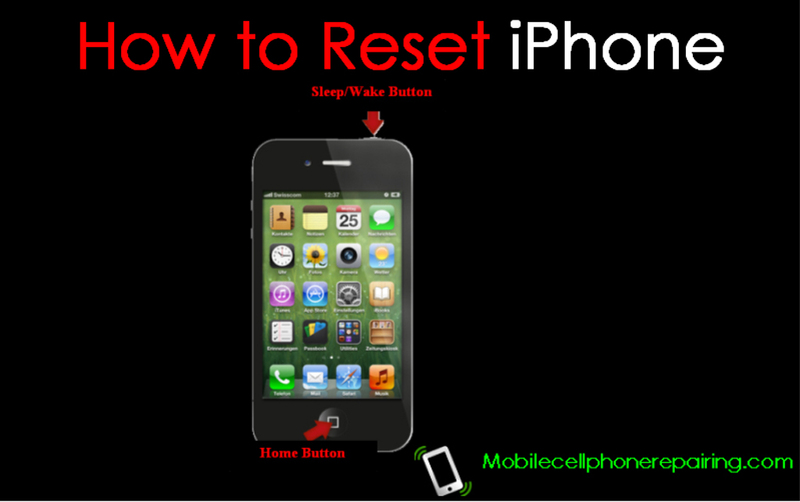 Soft reset does not delete or removes ant data or information, apps, songs, contacts etc from the iPhone. Hard Reset – Hard Reset and Factory Reset are same thing. This option should be the last choice when no other tips and tricks work. Hard Reset resets the iPhone to its factory settings. This means that after hard reset, your iPhone will be in the same condition as it was shipped from the factory. There is different procedure to do a full “hard reset” and this will erase or delete everything from the mobile phone and restore the iPhone to its factory settings. Simultaneously press and hold the Home button located at the center bottom of the iPhone and the Sleep/Wake button located at the top of the iPhone. Continue holding both buttons until the iPhone shuts down and again restarts. The process could take about 10 to 20 seconds. Once the iPhone shuts down, you can leave the buttons. After 10 to 20 seconds you will see the Apple logo on the screen. Now the soft reset of your iPhone is done. Scroll down and select “Reset“. Here you will find few options like – Reset All Settings, Erase All content and Settings, Reset Network Settings. The iPhone will ask for pass code / password. Enter the password and confirm. Now the phone will start the reset process which could take few minutes. Sit down and allow the phone to reset itself. Once hard reset is done, your iPhone will be same as it was shipped from the factory. If you updated the iOS, then after reset, the iPhone will have the LAST Version of iOS. Very soon I will write Articles on these Topics. How to activate the iPhone 4s with or without SIM. Please where to get pass code/pass word for Hard/Factory Reset of iphone? thank you for this informative tutorial GOD BLESS! i felt a heartlly pleasure to get this site….. thank you sir. I was in need of it. my iPhone5 was locked with repetitive trial of lock paterns .. it requires I cloud no; and I can’t get it… how could I re use my phone please? thank you. Sharpsontech from Nigeria, I must thank you for repairs tutorial, they are very informative and wish to got must on latest smartphones. God bless!